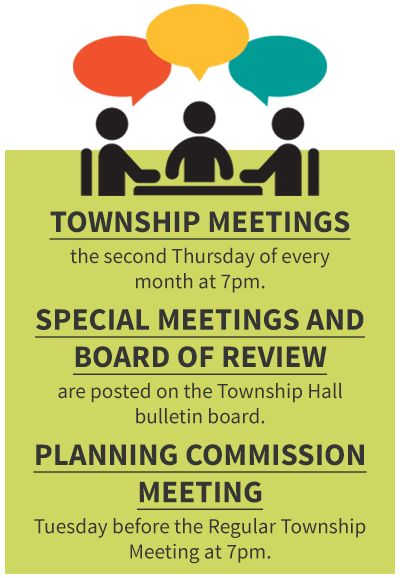 We have had many meetings since the last Newsletter, including Public Hearings on the Master Plan updating, proposed amends to the Master Plan and Zoning Ordinance changes. The Planning Commission has approved the definitive versions of each and we are recommending the changes to the Township Board for their review/approval. The Planning Commission approved a definitive version of the Zoning Ordinance regarding side setbacks in noncompliance sites which will bring them into compliance with the back setback as identified in the Zoning Ordinance. We are also recommending for review/approval, the reduction of the square footage for a home from 750 sq. ft. to 225 sq. ft. to cover the permitting gap between the Chippewa County permitting standards. This change will also allow Tiny Homes in our community. The Chippewa County Standard does not require a permit for structures that are 200 sq. ft. or less. We currently do not have any meetings planned for the near future. So, we are wishing you Happy Holidays and a winter that you enjoy.